Even though colorectal cancer will affect more than 4 percent of the U.S. population, incidence of colorectal cancer has been decreasing since the mid-1980s. One of the main reasons for this is increased awareness of screenings such as colonoscopy. To get more people checked and to address and treat colorectal cancer and other colorectal health issues, UHS recently hired Neil Gibson, MD, a colorectal surgeon who has trained at leading universities as well as the Cleveland Clinic in Cleveland, Ohio. 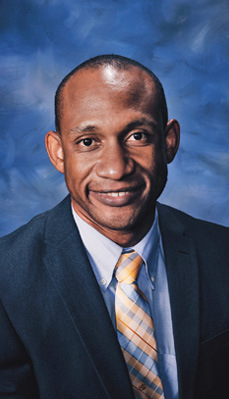 Dr. Gibson was inspired to train in the medical and surgical management of colorectal conditions—which includes diverticular disease, pilonidal disease and inflammatory bowel disease, in addition to colorectal cancer—because of his experience at the Cleveland Clinic and his own family history of colon cancer. At UHS, Dr. Gibson continues his patient-centered response to colorectal disease. He works closely with patients and the UHS clinical team to create individualized plans that address each patient’s needs from diagnosis to treatment, follow-up care and support. “Having UHS medical oncologists in house, plus two full-time radiation oncologists and the nurse navigator program adds to the comprehensive approach we offer and truly benefits our patients,” says Dr. Gibson. Whether you have an issue that can be managed with lifestyle changes or medication, or requires minimally invasive surgery, such as laparoscopy, or traditional surgery, the specialized care offered by Dr. Gibson and his team is tailored to your specific condition and needs. Screening for early detection of colorectal cancer gives you the best chance for effective treatment, a better quality of life and survival if cancer is found. One of the most common and highly recommended screenings for catching colorectal cancer early is colonoscopy. Use this guide to determine when you should get one yourself. Do you have a history of colorectal cancer? If YES: Was your relative younger than age 50 when they were diagnosed? If YES: Start screenings 10 years prior to your relative’s age at diagnosis and continue being screened every 10 years thereafter. If NO: Start screenings at age 40 and continue being screened every 10 years thereafter. If NO: Start screenings at age 50 and continue being screened every 10 years thereafter. If you think you may have a colorectal issue, talk to your doctor about a referral to Dr. Gibson’s practice. For more information or to make an appointment, call 763-8100.